A must read for all parents AND coaches! So much is said about sports parents these days, and rightly so. As the joke goes, remember the players are kids, the coaches volunteer and the umpires are human – it’s not major league baseball you’re watching as you sit on those cold metal bleachers at your town’s local baseball field. In other words, parents, sit down and shut up. What is not talked about as much are the coaches. These men we entrust our children to for a third of the year. Each season is an opportunity for both coaches and players – but perhaps the real question is: an opportunity for what? I think back to the coaches we had – men with demanding careers who were willing, some even eager, to put in all that extra time to coach a large group of boys. They were all coaching their son’s baseball team, but their own love of the game, for SOME of them, really showed through. Others did it because the League begged for more coaches – so they stepped up and helped out. There’s a lot to be said for busy men willing to take on even more just so that a group of boys can play baseball. My son had six baseball coaches over his Little League career (not counting the shorter season Fall Ball teams). You get picked or drafted on a team and as the old saying goes, “You get what you get and you don’t get upset.” We were fortunate for a long time to get good coaches (a couple were just okay and a couple were really exceptional). We heard the occasional horror stories from friends playing on other teams and felt lucky we didn’t have the yellers or screamers. Of course, it is hard to escape favoritism on any team you’re on, but my son at least got a chance to prove himself. And he did, each and every time, and we were fortunate that even those coaches were open-minded enough to recognize what he had to offer. Until we got a coach that didn’t – the Knucklehead I call him. I suppose every player deals with at least one knucklehead coach, and I get that is the way it “should” be (although really??). You learn from adversity, life isn’t fair, there are people in the world (grown-up, intelligent people) that are idiots, that’s just the way the ball bounces, etc. I would be okay with all of that if this Knucklehead didn’t end up doing the unthinkable: sadly, he destroyed the love of the game for my once-passionate son. Through it all, my son held his head high while keeping this coach’s bench warm. My previous all-star pitcher with a sharp mind for strategy never complained once about being designated to the outfield for the required two innings that you “have to play” each player and never being allowed to throw a pitch. Not one pitch. The kid with the best strikeout record and pitching stats on his previous year’s team never allowed the chance to show his stuff or even attempt to earn a spot in this new team’s rotation. Yes, the coach is always right – even when’s he wrong – but even when he’s a knucklehead?? My husband and I never threw a fit or made demands. We just got to watch the joy seep out of our 12-year old’s step and the passion fade from his eyes in the most painful way possible. The right coach knows how to work with the talent he has. He encourages and inspires kids to do their best. This guy knows that coaches have the power and the opportunity to shape lives – on and off the field. It is a lot to ask of anyone, yet the right coach makes it look effortless. He seemingly dedicates all his free time and energy to working with his team, nurturing and developing these young kids with the hopes of course of coming out victorious at the end of the season. However, the right coach realizes the secret of Little League baseball (at least according to this Zen Mama Wannabe) which is that it was never about the actual wins and losses! This is Little League, not MLB – remember?!? Like many parents, I have spent my fair share of time sitting on the bleachers watching Little League games. I’ve sat through freezing cold mornings, blistering hot afternoons, rain showers and even thunderstorms (if you see lightening they will call the game – otherwise, even with the torrential downpour we suffered through, the game will go on). Needless to say, I don’t miss any of that. This post was inspired by The Matheny Manifesto by Mike Matheny. Current St Louis Cardinals manager Matheny shares his tough-love philosophy for children’s team sports that translate to everyday life. 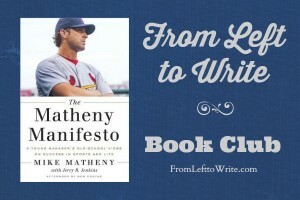 “Ironically, if I had learned anything from baseball, from all the coaching and training and the practices and the development, it was that so much more went into making a child an adult than teaching athletic skills and how to win games.” Please join From Left to Write on February 12th as we discuss The Matheny Manifesto. As a member, I received a copy of the book for review purposes. What a knucklehead! Adults have so much power to crush a kid’s dream. I’m sorry he went through that. I think it is true for all kinds of coaches in all kinds of sports. I have struggled with watching my daughter sit out a competition or two this season and like your son seen her enthusiasm and passion fade. I do wonder though if she is truly passionate about her sport will one really bad season/coach be enough to derail her? I guess time will tell.